I’d heard strong reports about Maki Maki and have always really enjoyed their sister restaurant Maki & Ramen so a lunchtime visit was long overdue. It’s a compact little place with seating for maybe eight at the counter. It’s a classic sushi bar set-up which allows you to get a good feel for how the processes in the restaurant work. 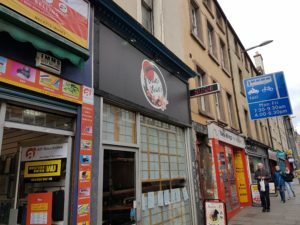 They have a broad selection and I was keen to give their ramen a try. I added pork gyoza because I generally can’t resist and some green tea for liquid refreshment. The ramen was first up and was just the dish I was looking for. I’d opted for the salmon variety and it was deeply flavourful. 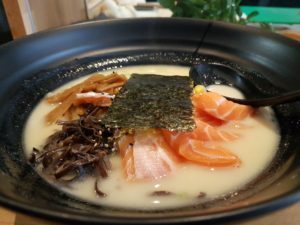 The broth had a light milkiness to it and the salmon sashimi was very good. It was a really satisfying eat. 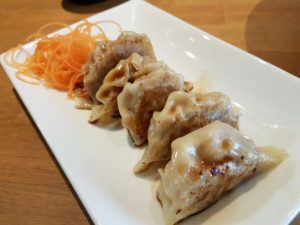 The gyoza were nicely crafted, too, and blended the expected delicacy with sesame pork punch. So overall, Maki Maki served my needs splendidly. Their ramen was deeply satisfying. I’d be happy to visit again and would be pleased to point you in their direction. They’re a fine purveyor of Japanese grub that will bring warmth and comfort into your life.